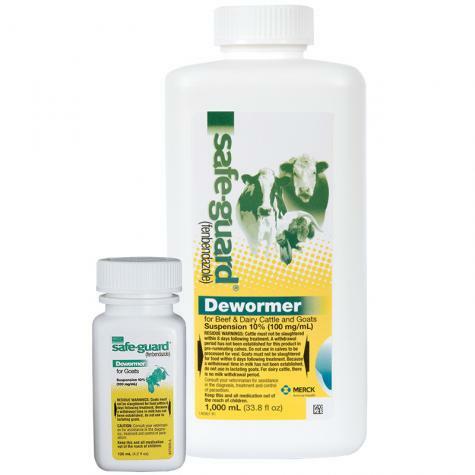 A dewormer for beef and dairy cattle and goats. Under conditions of continued exposure to parasites, retreatment may be needed after 4 to 6 weeks. Store between 35° and 77°. Shake well before using. Goat Dosage: 2.3 mg/lb (5 mg/kg) or 0.6 mL per 25 lb body weight for the removal and control of Stomach worms (adults). Beef & Dairy Cattle Dosage: 2.3 mg/lb (5 mg/kg) body weight for the removal and control of lungworm, stomach worm (adults), brown stomach worm, stomach worms (fourth stage larvae), barberpole worm and small stomach worm, intestinal worms (adults and fourth stage larvae), hookworm, threadnecked intestinal worm, small intestinal worm, bankrupt worm and nodular worm. Withdrawal prior to slaughter—8 days (cattle) and 6 days (goats). Restricted drug in CA. See warning and caution on label. Use this high capacity syringe & drencher to vaccinate or drench your animals for internal parasites. Supplies drench to our 5 ml and 12.5 ml automatic drenchers to reduce the need to refill smaller containers. For dosing high volumes of fluid such as “show shakes” or other treatments.